You may remember last year’s eruption of Mt Merapi caused a layer of corrosive ash to coat Borobudur. Conservation specialists working in Indonesia are now appealing for public funds to help with the cost of cleaning up the ash in the wake of the disaster. Readers interested in making a financial donation to help the preservation of Borobudur can make a donation on the official site here. Conservation experts are racing against time to preserve the Borobudur World Heritage Site which was severely damaged by a volcanic eruption in Indonesia last year – and authorities have issued a call for global financial assistance to help safeguard the historic site. The site was badly damaged when the active volcano Mount Merapi erupted on Oct 26 last year, reports Antara news agency. The Indonesian National Disaster Management Agency reported a month later that the eruption had killed 322, injured 776 and displaced 136,585 people who made a living from Mount Merapi’s fertile slopes. 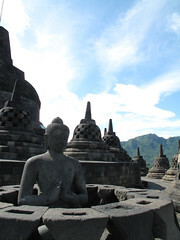 Besides this catastrophic human toll, the volcano blanketed the surrounding areas in volcanic ash, posing a threat to ancient cultural icons such as the Borobudur Temple Compounds.